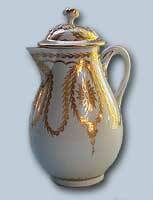 The society, established in 1949, welcomes all those interested in pottery and porcelain, whether antique or modern. The society provides a friendly forum where information can be learned and exchanged with other enthusiasts. There are six meetings a year held at Roseville Uniting Church Hall, 7 Lord Street, Roseville. Seminars and other events also occur such as the 50th Anniversary Exhibition "Fired with Enthusiasm" at the Powerhouse Museum in March 1999. Members receive six newsletters a year containing meeting notes, book reviews and general information on Ceramics in Australia and overseas. Concessions may be obtained using the Society membership cards.